Last Date for this post is already over. Office Of District Collector, South Goa Notification is out. Office Of District Collector, South Goa is recruiting for 140 Junior Stenographer And Others Post Govt Job Posts. You can check Office Of District Collector, South Goa - Office Of District Collector, South Goa last date, download Office Of District Collector, South Goa notification, visit Office Of District Collector, South Goa official website and check other Office Of District Collector, South Goa Vacancy details.Complete Vacancy and recruitment Details about 140 Junior Stenographer And Others Post Govt Job vacancies in Office Of District Collector, South Goa are provided below by JobSarkari.Com only for you. Last Date of Receipt Application Form. 11/02/2019. Junior Stenographer. 08. 03. 00. 03. 01. 15. Talathi. 05. 02. 00. 02. 00. 09. Multi Tasking Staff. 17. 07. 01. 06. 00. 31. Total Vacancy. 80. 30. 03. 24. 03. 140. Junior Stenographer. Candidate Must Have Passed Class 12th And Having Knowledge of Computer With 100 WPM in Shorthand And 35 WPM in Typewriting With Knowledge of Konkani. Talathi. Candidate Must Have Passed Degree And Having Diploma in Computer of 6 Months And Having Knowledge of 6 Months. Lower Division Clerk. Candidate Must Have Passed Class 12th And Having Knowledge of Computer With Konkani. Multi Tasking Staff. Candidate Must Have Passed Class 10th. Must Have Passed Course by ITI in Related Trade. Age Relaxation. 3 Years For OBC. 5 Years For SC/ST And 10 Years For PH. 2. Candidate Need to Download Application Form As Given on our Website. 3. Candidate Need to Fill All the Details in Application Form And Need to attach All Mandatory Documents As Mentioned in Notification. 4. Candidate Need to Send the Application Form on Given Address on or Before 11th February 2019. The Collector, South Goa District, Matanhy Saldanha Administrative Complex, Margao- Goa. Q. 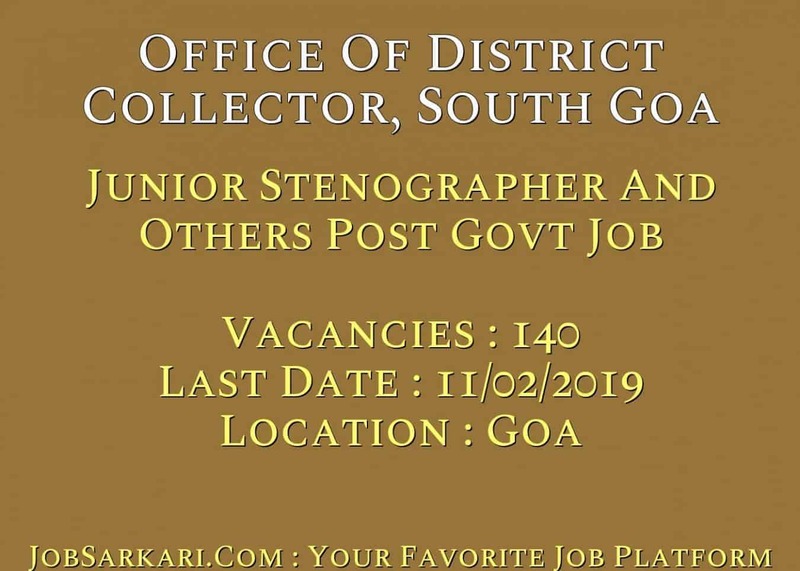 What is the Last Date For Office Of District Collector, South Goa Junior Stenographer And Others Post Govt Job Vacancy ? A. 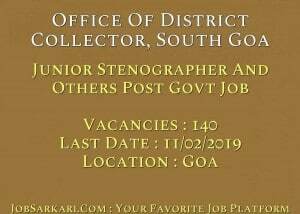 Last Date for Office Of District Collector, South Goa Junior Stenographer And Others Post Govt Job Posts is 11/02/2019. Q. What is the Form Type of Office Of District Collector, South Goa Junior Stenographer And Others Post Govt Job Recruitment ? A. The Form Type for Office Of District Collector, South Goa Junior Stenographer And Others Post Govt Job Posts is Offline. Q. How many vacancies are available in Office Of District Collector, South Goa Junior Stenographer And Others Post Govt Job Posts ? A. There are about 100 Vacancies in Office Of District Collector, South Goa Junior Stenographer And Others Post Govt Job Posts. Q. What is the Full Form of Office Of District Collector, South Goa ? A. Full Form of Office Of District Collector, South Goa is Office Of District Collector, South Goa .